Birchover is a village and civil parish in the Peak District National Park, in Derbyshire, England. It is about five miles north-west of Matlock, and according to the 2001 UK census had a population of 362. Eagle Tor is a small hamlet on the north western edge of the parish of Birchover. Birchover is situated near a number of features of geologic and historic interest: a rock formation called Rowtor Rocks, consisting of numerous tunnels, carvings and caves; several prehistoric monuments, including Doll Tor; and a number of stone circles on Stanton Moor. Some people believe that the area was once used by Druids as a ceremonial worship site. This theory is supported by the local stone circle and the strange carvings to be found in the rock formation by the village. Birchover was mentioned in the Domesday book as belonging to Henry de Ferrers and being worth eight shillings. Bradley Rocks near Birchover features as the location of the farm in the 1987 film The Princess Bride. The horror writer Joseph Freeman based a story here, 'A Room of his Own', in his first book Love Stories of the Undead (later reprinted in 2008's "This Is My Blood"), and has had articles published in Saccade magazine and a charity anthology called Dog Tales based on real-life eerie events in the nearby area. ^ "Boundary Map of Birchover CP". Retrieved March 2, 2014. ^ Turton, P. H. (1933). "The Distribution of Simple Goitre in Derbyshire". Proceedings of the Royal Society of Medicine. 26 (9): 1223–66. PMC 2204926. PMID 19989417. 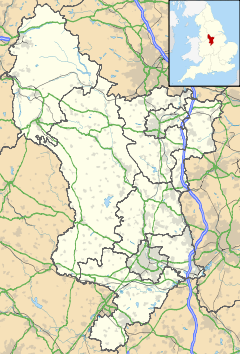 ^ Henry was given a large number of manors in Derbyshire including Doveridge, Linton, Breadsall and Great Longstone. Wikimedia Commons has media related to Birchover. This Derbyshire location article is a stub. You can help Wikipedia by expanding it. This page was last edited on 13 December 2018, at 08:11 (UTC).